1. 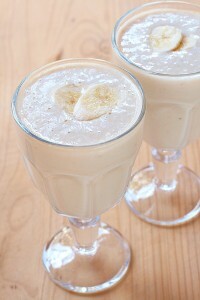 In a blender, blend milk and chopped bananas. 2. Pour the banana/milk mixture into a pan and set stove on high heat. 3. Add the powered sugar slowly, stirring continuously. 4. Bring mixture to a boil. 5. Make sure the smoothie is of even consistency. 6. Take mixture off of heat and set aside to cool. 7. Decorate with chopped pistachios and serve chilled.